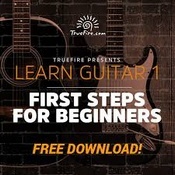 True Fire has a truly massive library of guitar lessons that are consumable a la carte or part of an all access pass. You have all the power to craft your own courses according to your abilities and needs and even get private lessons with over 40 instructors. The software-based learning helps are fantastic. Guitar Tricks promises to take the fear and loathing out of learning to play guitar and make it fun. You’ll get access to a variety of instructors who won’t overwhelm you and lessons that are sliced up into manageable modules per lesson. A progress report and toolbox help you keep moving forward. JamPlay has an extensive library of courses and resources for helping guitar players of all skill levels and interests improve everything about their playing ability. The website is jam packed full of tutorials, videos, games, tools, and community areas. Gibson’s Learn and Master lesson series is a 25-disc DVD set that uses various modes of learning to achieve mastery of the guitar. Whether you’re just starting out or you have some experience playing guitar, this lesson system will have something for you, if you’re okay with a strictly offline learning experience. Elmore Music is a website that offers online videos, a downloadable report, and DVD-based guitar learning programs. The online videos and downloads are free. The DVD-based materials are sold individually at varying prices and carry a 60-day money-back guarantee. Jamorama provides computer-based training through a single, convenient user interface. There is a free, basic access plan to get started and a full access plan for a one-time cost of $99.95 if you find it valuable enough to continue using past Stage 1. Artist Works presents a comprehensive set of lessons based on multiple instruments, teachers, and styles. Costs also vary depending on the selected instrument, genre, and instructor. If you want a guitar learning focus on only one genre with a single teacher, this system is for you. But, Artist Works doesn’t offer the well-rounded, simple package structure offered by most providers of Guitar Lessons in our review.